From the mid-Nineties, “Roma Tre” University’s Department of Communication and Spectacle (Di.Co.Spe.) reflects on changes in cinema and other arts, analysing new tendencies and perspectives linked to the evolution of languages, modes of production and making of films. The Conference for 2010 will be on the relationship between “Cinema and Energy”, being energy a concept that invest social life all over the world (besides of human science and scientific research). Both are the , which started in 2008 with the essay written for Bruce Sterling’s Fabrica Workshop, continued with the lecture taken at Museo della Scienza in Naples in 2009 and fixed with the curatorship at Sincronie Festival 2009. In his On the Nature of Things, Lucretius denies any sort of creation, providence and original beatitude, stating that man broke free from his condition of ever present need through the use of techniques, which are transpositions of nature. The gods do exist, although they neither created universe nor they care about men’s problems. Lucretius affirms that all our knowledge about nature shows us the universe as infinite, made by complex forms and composed by atoms.It follows natural laws, regardless of man’s needs, and can be explained without resorting to deities. Between 1899 and 1904 the German philosopher and biologist Ernst Haeckel published a book of lithographic and autotype prints entitled Kunstformen der Natur (Art Forms of Nature), one of his best known works and a symbol of his zoological research and philosophy, centered on the observation of marine micro-organisms and various natural species and animals. The complete volume, consisting of over 100 lithographs, each accompanied by a short descriptive text, obtained a great success even among the non-specialist public and among some Art Nouveau artists, committed to find new models to be used in the nascent industrial design and in architecture. In this regard, the volume lends itself to multiple assessments: as a zoological work depicting the evolution of organisms, as a work of art, as a book of aesthetics that focuses on observation and perception as a way of knowing. Aesthetics, as the science of beauty, intent on understanding the nature in relation to art. The tables of the book, according to a geometric arrangement of the drawings, are based upon the microscopic siliceous skeletons of radiolarians and diatoms, the umbrellas of jellyfishes, the tentacles of sea anemones and spirals shells of molluscs. These illustrations depict therefore the law that regulates natural energy phenomena: the evolution, the fact that organisms are formed and transformed over time, according to genetic relationships of descent, from a common original type.Looking at these tables, we can see how nature is not only capable of creating spontaneous art forms, but also of establishing a direct connection with certain geometric aesthetics, starting from a fundamental unit/core and reaching a more complex entity, as consequent evolutionary practice of adaptation. One of the most currently fascinating mathematical theories is the Theory of Fractals: according to the definition of its recently passed away discoverer, the polish mathematician Benoit Mandelbrot (1975), who started his researches from the fractal structure found out by french mathematician Gaston Julia in 1920, fractals are geometrical figures characterized by a repetition to infinity of a same pattern on a more and more reduced scale. Mother Nature is filled with forms very similar to fractals, which don’t follow in any way any of the rules of Euclidean geometry. A coastline, the branches or the roots of a tree, a cloud, the snowflakes, the zigzag lightning bolts and the leaf venation patterns: these are only a few examples of fractal forms spontaneously creating in nature. Among these ones there is the spiral, the fractal form par excellence. So, how do we forget the hypnotic editing of energetic spontaneous fractal branches produced by a controlled electron beam, emitted from a cathode ray tube on a photographic paper, in the poetic audiovisual work Energie! from German artist Thorsten Fleisch? And, what about the time shifts, animations and techniques for microscopic natural observation in John Campbell masterpiece Li: The Patterns of Nature, showing how the natural world itself, due to reproductive, conservative and evolutionary processes, can create complex architectures and structures based on physical, chemical, electromagnetic phenomena ? The procedural, generative, hieratic and evolutionary element can be considered the root of all these arguments, related to a modern “computational ecology”: almost 40 years of studies, analysis and researches, have passed between Alan Turing‘s revolutionary theories about morphogenesis (the capability of every living being to develop complex bodies, starting from very simple elements, using self-assembling processes without an external guide), which followed those by bio-mathematician Thompson D’Arcy in his work On the growth and form (1917), and more recent studies (1980-1985) on genetic algorithms (a particular kind of evolutionary algorithms utilizing mutation, selection and other recombination techniques in order to guarantee a certain number of possible evolutive solutions. Those researches were meant to point out the almost computational characteristics of Mother Nature on one hand, while on the other they confirmed the machines’ capability of simulating/replicating complex natural phenomena. Speaking deeply about pure mathematics and numbers, we could consider also the four dimensional Quaternions, discovered in 1843 by Irish mathematician William Roman Hamilton, who was searching for a way to extend complex number on a higher quantity of spatial dimensions. Quaternions find uses today in both theoretical and applied mathematics, in particular for calculations involving three-dimensional rotations in computer vision: exactly what Thorsten Fleisch did in his work Gestalt. As stated by Thorsten Fleisch himself: “Given the fact that a film is the visualization of a mathematical element, it is theoretically possible to render it as high a resolution as technically feasible without losing any detail”. If we also take into consideration the definition of “Moirè effect” in the work Spray by Cartsen Nicolai, the direct connection between the audiovisual outcome and the numeric and mathematical element is very clear. In physics, the Moirè pattern indicates an interference figure, frequently found in nature, composed by two superimposed grids at a specific angle, or even by two parallel grids with distanced chains in slightly different ways. The Moirè optical effect is regulated by accurate and complex sinusoidal equation where, at the variation of parameters and variables ,correspond particular changes under the optical and visual point of view. Again, in 1787, the jurist, musician and physicist Ernst Chladni published a book called Entdeckungen über die Theorie des Klanges (Discoveries Concerning the Theory of Sound). With this text, based on experiments on the field and observations, Chladni laid the foundations for that discipline within physics that came to be called “Acoustics”, the science of sound. With the help of a violin bow which he drew perpendicularly across the edge of flat plates covered with sand, he observed how sound waves generate geometric patterns and shapes which today go by the term “Chladni figures”. In 1967, starting from Chladni studies, the Swiss doctor and naturalist Hans Jenny (1904-1972) published the book Kymatik – Wellen und Schwingungen mit ihrer Struktur und Dynamik (Cymatics – The Structure and Dynamics of Waves and Vibration). In the book (and many video-recordings) Jenny carries out all his experiments that shows what happened when someone takes various materials like sand, spores, iron filings, water, and viscous substances, and places them on metal plates and membranes vibrating by specific sound waves. Jenny turned these materials into alive and fluctuating forms, following geometric patterns created by using simple vibrational waves (pure tones) present in the audible field. 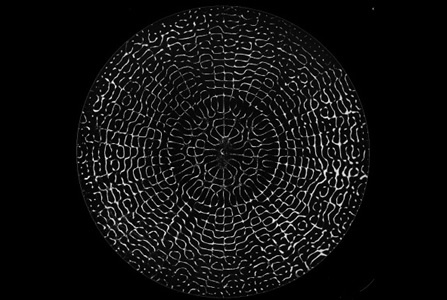 With this publication, Hans Jenny laid the foundations of Cymatics, the science studying the wave phenomena: for more than 25 years, poet, producer and editor Jeff Volk has been making Cymatics popular by producing all the books and videos that witness the experiences made by Swiss scientist Hans Jenny. The artists who paid homage to Cymatics studies was the American composer and musician Alvin Lucier, in the performance called The Queen of the South. Much of his work is influenced by science and explores the physical properties of sound itself: resonance of spaces, phase interference between closely-tuned pitches, and the transmission of sound through physical media. All the signs around us All these examples show clearly how Nature is characterized, at the root, by a matrix of numbers and mathematical expressions subtending a series of physical, optical, chemical-physical, electromagnetic phenomena influencing natural forms, species, colours, sounds and structures. If science is considered as a complex of knowledge obtained through a methodical procedure, capable of providing a precise description of the real aspect of things and the laws by which the phenomena happen, and if the rules governing such process are generally called “scientific method”, then the experimental observation of a natural event, the formulation of a general hypothesis about such event and the possibility of checking the hypothesis through subsequent observations, become fundamental elements in modern scientific (and artistic) research. What it is today recognized as “immersive art-science” is a form of creative expression meant to rise above the notion of art as abstract representation, in behalf of a multi-sensorial experience. The historical-critical statement of this lecture, and the “Hidden Worlds” screening connected to that, is to map those audiovisual artists acting with a “discovery approach”, observing and recording, sharing experiences and ideas with scientists and science communities, working without the use of cinematographic or video or digital tecniques but obtaining the flux of sound and images only by natural and spontaneous scientific phenomena (physical, optical, chemical, mathemical and electro-magnetical). Immersivity awakens a synesthetic awareness, both in the mental and in the physical space. A myriad of vibrant phenomena, usually beyond the observer’s reach, are instead made reachable through an accurate psycho-physical conditioning.